Honoring the Doughboys: Following My Grandfather’s World War I Diary is a stunning presentation of contemporary photographs taken by the author paired with diary entries written by his grandfather, George A. Carlson, who was a soldier in the U.S. Army during World War I. Lowdermilk followed his grandfather’s path through France, Belgium, Luxembourg, and Germany, and returned with these meticulously crafted photographs and his own engaging stories that bring the diary to life for contemporary readers. Lowdermilk’s passion for World War I and military history began as a young boy when he listened to his grandfather tell his stories about serving as a foot soldier—a “doughboy”––in Europe during the Great War. 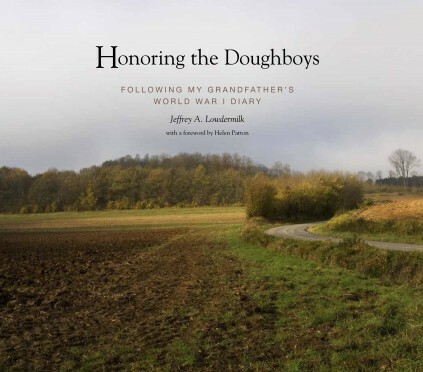 When his grandfather passed away in 1982, Lowdermilk’s mother gave him her father’s diary, which included not only lengthy descriptions of the landscapes, towns, and battles he had experienced, but also keen observations and insights about life as a doughboy for Mr. Carlson and his buddies. Lowdermilk became fascinated with the diary, first transcribing it, and then plotting his grandfather’s path through France, Belgium and Germany as part of the American Expeditionary Forces. He immersed himself in the history of World War I and its geography, eventually retracing, over a dozen years, the trajectory of his father’s journey. This image-rich tour of European landscapes, battlefields, and monuments offers the reader an experience that is at once an intimate reliving of Carlson’s time as a doughboy, a lively collection of Lowdermilk’s travel anecdotes, and a moving expression of gratitude to American veterans of the Great War. The foreword by Helen Patton, granddaughter of General George S. Patton, Jr., adds an extra dimension to the narrative. Jeffrey A. Lowdermilk is a writer, photographer, lecturer, and student of the First and Second World Wars. He has traveled extensively throughout Europe, documenting the path detailed in his grandfather’s World War I diary. He is the author of Saluting America’s World War I Heroes, a historical narrative and photography presentation that documents the eighty-seventh anniversary of the Armistice. He lives in Santa Fe, New Mexico, with his wife, Annie. Helen Patton is the granddaughter of General George S. Patton, Jr., Chairwoman of the Patton Foundation, and the author of Portraits of Service: Looking into the Faces of Veterans. She lives in Reims, France. Endorsed by the U.S. World War I Centennial Commission. Nominated for a 2015 IPPY Award from the Independent Publishers Association. April 26 at 1 p.m. and 27 at 10:30 a.m.
February 17, 2015 at 7 p.m.
Tuesday, November 18, 2014 1 p.m. and 7 p.m.
Wednesday, October 29, 2014 at 6 p.m.